Nectar of Life Coffee Company is a gourmet coffee roaster located in the beautiful Pacific Northwest of the United States. We are located on the breathtaking Oregon Coast between Brookings-Harbor and Gold Beach. We have staff that can assist you in both North Idaho, and Spokane, WA. Contact us for more information! We only roast shade grown, certified organic Fair Trade coffees. We believe in preserving the environment and social justice. We use energy efficient roasters and have a local box reuse program. We have all our wholesale clients hold our boxes to be returned upon the following week's delivery. This way we can reuse a box until it is no longer structurally feasible. At that time the box is recycled. This practice is MUCH more environmentally responsible than recycling alone. Martin and Hannah Jennings founded nectar of Life Coffee Company in January 2003. Their quest was (and is) first, to roast only the finest gourmet Arabica coffees, and second, to roast only coffees that are certified both organic and Fair Trade. It is Nectar of Life's belief that the best way to make Fair Trade certified coffees a staple, instead of a novelty, is to provide the public with organic Fair Trade coffees that rival the world's finest gourmet coffees and to offer these coffees at a reasonable price. 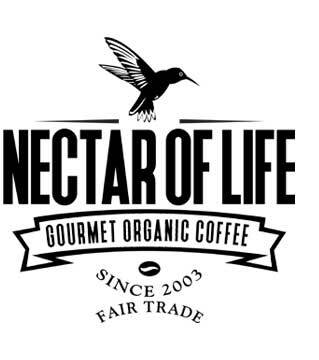 Since its foundation, Nectar of Life Coffee Co. has grown to symbolize the pinnacle of gourmet organic coffee and has firmly stood on its guiding principles of ecological and social responsibility. 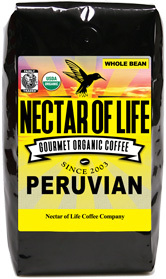 Nectar of Life Coffee Company only roasts certified organic Fair Trade shade grown (when possible) gourmet coffees. We never use robusta coffees and only source the finest Arabica varieties. 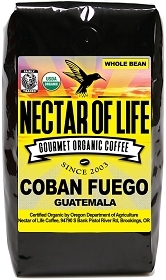 Nectar of Life is a USDA certified organic coffee roaster and a Fair Trade certified coffee roaster. At this time Nectar of Life Coffee Company is primarily a wholesale organic coffee roaster. Our only retail outlet is through the internet. We feel it is more important to focus on producing stellar coffees than be distracted with operating a café. If you would like to carry our coffees in your café then you can contact us by using our Contact Us page. If you are opening a coffee stand, or Cafe and want the best coffee on the Oregon Coast, then we're you're wholesale coffee roaster. Nectar of Life Coffee Company supports the Catholic Relief Services (CRS) Ethical Trade Program. If you would like to learn more about the CRS Fair Trade Program please click Here. Co-Founder and Master Roaster, Martin F. Jennings III, graduated with High Honors from the University of California, Davis with a degree in Viticulture and Enology. Martin went on to make fine wines in both California and Washington State. His love of coffee and organic products brought him to a point where he knew that there must be a way to roast organic coffees to have the same full-bodied flavors as the world's finest non-organic gourmet coffees. With his experience in chemistry, and sensory (flavor) science Martin left the wine industry to pursue roasting the finest organic coffees of the world. The result is the Nectar of Life®. Nectar of life Coffee Co. sources the highest quality gourmet Arabica coffees from around the world. Current blends contain coffees from the following countries: Bolivia, Colombia, Costa Rica, East Timor, Ethiopia, Guatemala, Honduras, Mexico, Nicaragua, Papua New Guinea, Peru, Sumatra and more. Each coffee is chosen based on meticulous sampling. 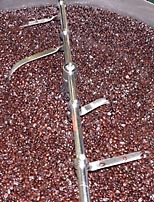 Unlike other coffee companies, Nectar of Life roasts each coffee separately to its own unique flavor profile prior to blending. This method is much more laborious than roasting a blend in one batch, but the result is more than worth the effort. Each blend is heat sealed in de-gassing valve equipped bags within hours of roasting, ensuring a coffee that will taste fresh roasted for up to one year after roasting. Our roasting facility utilizes low input technology resulting in great tasting coffee with a minimal environmental footprint. 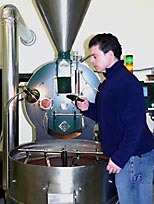 If you would like to tour our roasting facility please use our Contact Us form to set up an appointment.